This is a re-post from the first two months of my blog that pertains to my 31 Days of Nostalgia Series. Never in my lifetime have I heard Charles referred to as Charlie or Chuck, only as Charles. I never got the opportunity to call him Uncle Charles, because even though he was my dad's younger brother, we never met. Charles died tragically in an automobile accident in his late teens, before I was born. 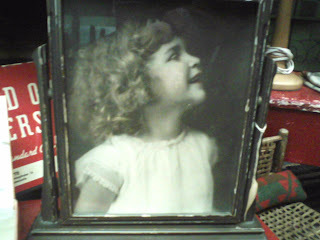 An 8" x 10" of the above photograph, in a gold metal frame, was a constant on the dresser in my grandma's bedroom. She spoke of Charles frequently and lovingly. It was a loss almost too much for her to bear. A handsome kid that never became a man. Never married. Never had any children. Never had time. Now that my grandma and grandpa are gone, and my dad has also passed on, who is left to remember the short life of Charles? What happens to his pocket watch, his old wallet, his old report cards, his valentines and his photographs? 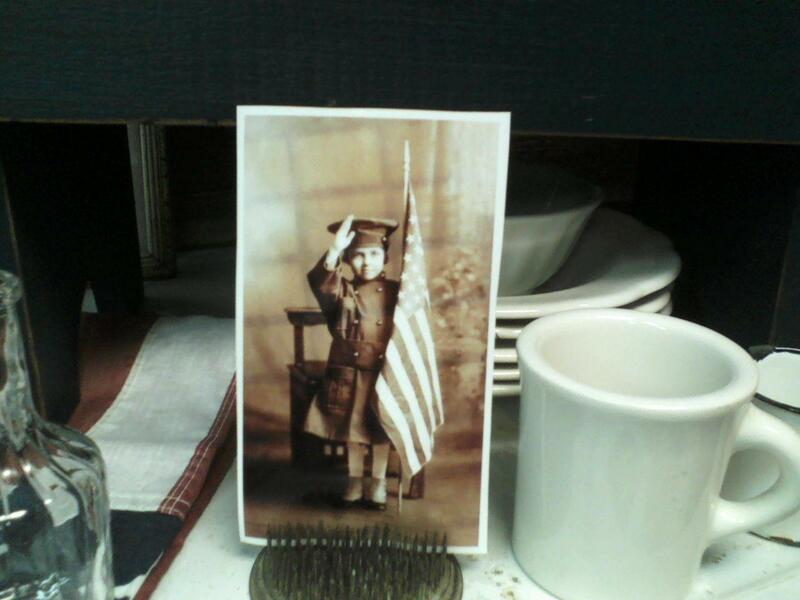 Sometimes I see old photos like this in antique stores, and I feel sad. I snapped these two photos this morning with my cell phone camera at my favorite antique and consignment store. An adorable little boy and girl whose photos have made their way from family albums to sales inventory. I guess it happens. But for now, I will keep the few mementos commemorating the short life of my Uncle Charles all together, in one place. For now, Uncle Charles, your pocket watch and photos won't be sold as antique store inventory, and your school report cards, valentines, and Sunday School perfect attendance awards won't be thrown in the trash. But, who will be our next family historian? Will anyone still think of Charles? So true. I always look at the pictures being sold and I can't help think "why." My mom is the last of her family. She has boxes and boxes of photos that I have no idea who the people are. I went through some awhile ago and took out the ones that I knew. I will have a hard time parting with them someday but what do you do. Glad you are keeping Charles' memories. It started with an old box of photographs my grandmother treasured that were passed on to me. I too have become the "keeper" of the family history. My grandmother would bring out the box and tell me about the relatives in the photographs. Thankfully she wrote the names on the backs. I too wonder who will become the keeper of the memories when I am gone. Oh, you know my heart! That's exactly why I collect so many things--family and vintage. I don't want these loved ones to be forgotten. In fact, I just bought a framed photo of a lovely little boy, whose Mom had added a lock of his hair to it behind the glass. I have no idea who he was, but for now, I've adopted him! Thank you for such a heart-felt post! Carlene this is a sad story. I wonder sometimes who will care about some of the old photos of family I have. Glad you are the family historian for now! I'm my family historian...hoping to inspire the next generation! Carlene, Such a wonderful memory of your Uncle Charles. I'm sure you'll pass these memorabilia down to your children to help connect the generations. What an endearing post, Charlene! I am the family historian in my family! I love all the pictures, etc that are old. My favorite are old letters! My grandfather was a poet and had 40 books of poetry! I hope I get a few!!! Bless your heart for keeping Charles' memory alive! A lovely post, Carlene. I often think the same thing when I see old photos stuffed into a bin at an antique store. In fact, I have two bubble glass framed pictures of a brother and sister on my bedroom wall that I bought over 30 years ago. I know who they were, but can't believe none of their family members wanted the pictures. I loved your post! I love reading other folk's history! Thanks so much for popping in to see me and your kind comments. Loved this post. My mom has kept all the family photos and stuff...and some of it is now coming down to me...and then one day will go to my oldest daughter. We all are wanting to make sure that our family tresures stay in the family for as long as it can. I'm sure that your Uncle Charles is smiling down at you. I’m never been a big fan of compiling old pictures and old stuff cause I find it creepy to be honest but I was literally blown away with this article and inspired a bit… I’m just glad to pass by on this… Thanks for sharing!!! I have all of my family's photos here with me and until I read your post I never thought what would happen to them after I'm gone. I guess I need to make plans for them! It's like an important ceremony that you are preserving the legacy of Charles and of your family. I have a slight obsession with photos and have since I was a kid and discovered that I had no baby book and only a few baby pictures. I was the last of 8 kids and well, the sister who was born when my dad had a new camera seemed to get the most shots taken. This fueled my love of photos and memories. Anyway, I do sometimes get nervous about what will happen to all the photos I've been saving and collecting. Better start planning that out!